The Viharnra Sien Chinese temple in Pattaya is one of Thailand’s most important centers of Chinese culture and works of art. It is home to one of the greatest collections of Chinese art and antiquities outside of China itself. Thailand and China have a historically long relationship. There is a large Thai-Chinese population in Thailand today that can trace their roots back to ancestors who emigrated from China. They brought with them aspects of their culture, food, religion, and art. 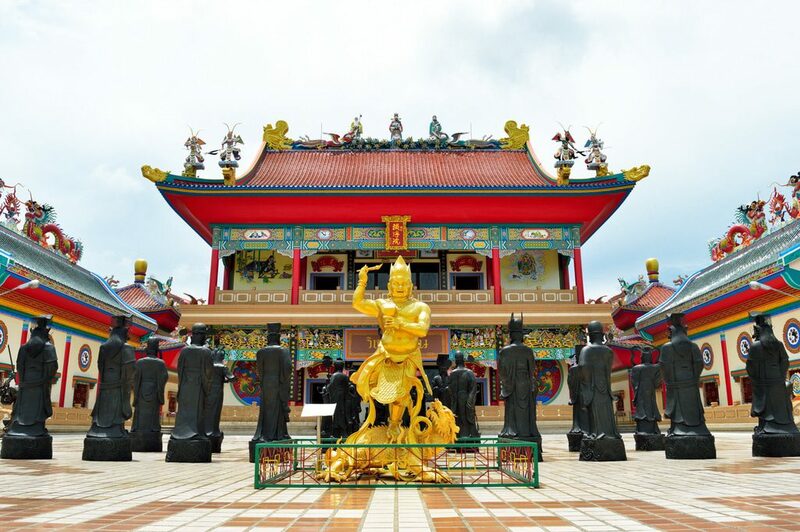 The Viharnra Sien temple pays homage to this long-standing relationship. The Viharnra Sien temple was the vision of Master Sa-nga Kulkobkiat. Born in Bangkok Thailand in 1925, but raised in China, this temple was one of his legacies celebrating the cultures of both countries. He also created a second Viharnra Sien in Chaozhou City, Guangdong, China. He wanted them to help encourage cooperation between China and Thailand. In 1987, Master Sa-nga Kulkobkiat’s vision was turned into reality. Then King Bhumibol Adulyadej gave him royal permission to construct the temple complex. 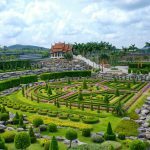 The King granted him 7 rai of land (2.7 acres) to build on within the Wat Yansangwararam temple grounds. On June 6th, 1988 the King inaugurated the construction and gave it the Thai name Anek Kusala Sala. Master Kulkobkiat oversaw the entire project, from design through construction. In a little over 5 years the temple held its opening ceremony on December 24th, 1993. 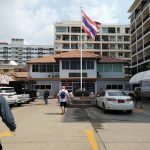 In the ceremony, the Thai-Chinese offered the building and donated many great antiques and artworks in honor of the King. 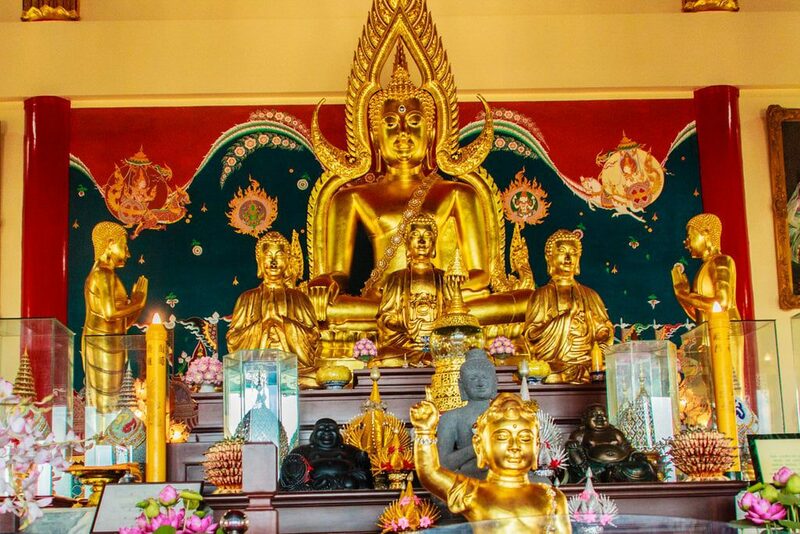 The temple has a massive collection of bronze statues, jade carvings, paintings, and countless other pieces of Thai and Chinese art and cultural relics. The Chinese government has also contributed a large number of pieces for permanent display at the temple. When you first arrive you’ll see the large Chinese gate with its red tiled roof and decorative golden dragons. Two large yin and yang signs flank the entrance. The museum and temple are set off in the background, looking like an ancient Chinese palace protected by its outer walls. After passing through the gate you’ll find yourself in a courtyard paved in concrete and decorated with a collection of bronze statues, trees, plants, and flowers. Have a look around the peaceful setting before going inside. In one corner of the courtyard you’ll find a large statue of the founder, Master Sa-nga Kulkobkiat, seated in his chair. Once inside the museum, you’ll be able to see it’s large assortment of bronze statues and artwork, some thousands of years old. There are various collections of artwork related to the Chinese religions of Buddhism, Confucianism, and Taoism. Among the many drums, bells, Buddha statues, and other cultural artifacts you’ll find a miniature replica of the Terra Cotta Army archaeological site. There are even several real Terra Cotta warriors on display. A rare treat to see something like this outside of China. The other floors of the museum are worth visiting too. The highlight on the 2nd floor is the large outdoor terrace with Shaolin monks in different kung-fu poses. The 3rd floor houses the Thai history and artwork work and is well worth a look around. Food and drinks are sold at stands outside of the temple. Grabbing a snack is a good opportunity to head down to the lake which is across the street and check out the view. Take a look at this short video of Viharnra Sien. It is drone footage that really captures how large and amazing this temple is. It truly looks like a palace from this view. What Is The Correct Name For Viharnra Sien? You’ll see a lot of people refer to this temple with a variety of names – Viharnra Sien, Viharn Sien, Wihan Sien, Anek Kusala Sala. Which is correct? There are actually three correct names for the temple. The signs at the temple all read Viharnra Sien, so going on that alone is a good indicator that is the correct name. Yet Anek Kusala Sala and Dan Fu Yuan are also correct. The former is Thai, the latter a Chinese name which means “home of the gods”. All three are proper names for this Chinese Temple. However, as there is no exact transliteration to English, you’ll also get other spellings like Wihan Sien and Viharn Sien. Confused? Me too. A visit to Viharnra Sien can be combined with a visit to other nearby attractions like Khao Chi Chan and Wat Yansangwararam. Both of which are close to the temple. Location: The temple is located about 40 minutes south of Pattaya by car. 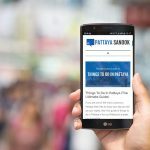 Due to the long distance from Pattaya, you’ll need to look at private transportation. Either hiring a car and driver, renting a taxi, or hiring a baht bus. Make sure you negotiate a price beforehand and make sure the driver will wait for you while you tour the temple, otherwise it may be tough to get a ride back. Another option is to book a tour. Your hotel can usually arrange that for you or you can visit one of the many tour stands scattered throughout the city.